Find here all our publicity campaigns. The ICM is based on an original financial model consisting of public and private funds: private financing is the strength of the Institute offering the flexibility needed to adapt quickly. 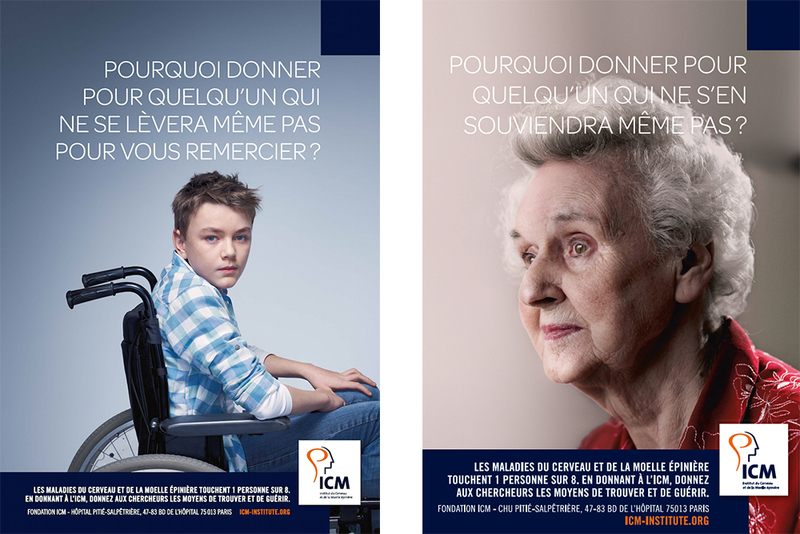 Patronage and donations are essential, which is why the ICM realized a new fundraising campaign placing its central activity at the centre of its communication: medical research. The Institute wished to transmit the message of how important it is to help research on diseases of the nervous system so that it advances. With humour, the publicity film imagined by Publicis Group, a historical partner of the ICM, created a surprise by addressing a broad public. On a bluesy background, four researchers, in the middle of their test tubes, begin a clumsy strip tease to collect funds to advance their work. With this publicity film and its simple setting, the ICM sought to address the public at large with the fundamental question: “Is this the only way to finance research on the brain and the spinal cord?”. Far from a guilt-inducing sermon, the campaign counted on the emotion aroused to transmit a very positive message: by contributing to the ICM you are giving researchers the means to fulfil their ambitions. This multimedia campaign (TV, movies, web) was supplemented by poster and press campaigns with same humour and wacky tone. On them model of “Save our planet,” “Save our brain, help researchers protect it”, the ICM continues to try to surprise readers by proposing a catchy phrase and an unexpected response in two new typographic messages of high intensity. This publicity campaign also included events in partnership with the RATP, long a sponsor of the Institute, intended to make Alzheimer’s disease a reality for a day for the users of the Paris transport system. In order to place them in the situation of someone who has the disease, the real maps of the metro in one of the Paris metro stations were replaced by false maps; the names of the stations were eliminated and not replaced. It was thus impossible for the users to know where they were or to orient themselves… exactly the kind of situation faced by patients with Alzheimer’s disease. Volunteers and researchers from the ICM were present to inform the users about the ICM and the research conducted on all the neurological and neurodegenerative diseases. Publicis Groupe, a historical partner of the ICM, conceived and produced, in 2010, the ‘pluri-media’ (television, print, web and radio) campaign of the Foundation: for the occasion, Richard Berry made a film (prod. WAM et Dog Production) featuring Jean Reno that used the traditional codes of a movie preview. 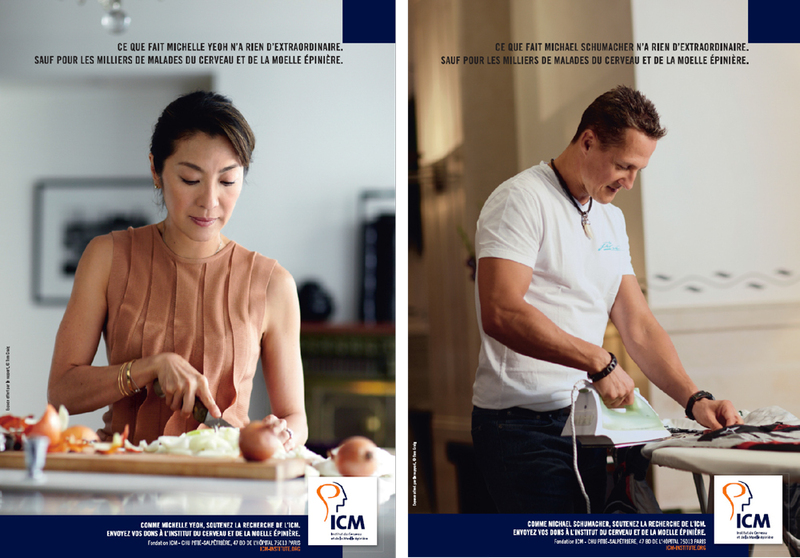 Diffused in 30s format for television and 60s for cinema, this film was the high point of a campaign that also included press announcements and posters, with Michael Schumacher, founding member and Michelle Yeoh, godmother of the ICM. These supports appeared gratuitously in the press and on poster displays. 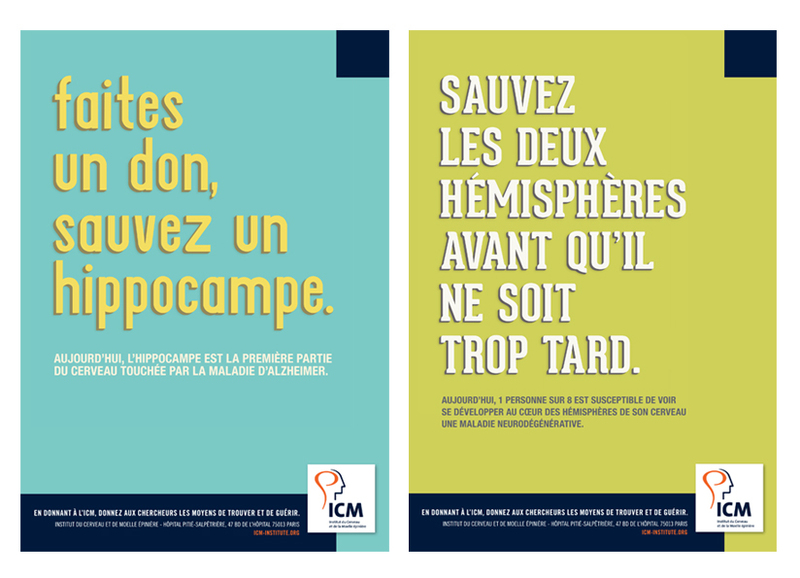 On the occasion of the World Day against Alzheimer’s disease, in 2007, the Brain and Spine Institute launched its publicity campaign in motion picture theatres with a film realized and produced by Luc Besson (Eurocorp), founding member of the ICM. There were eight versions of the film in French that varied in length from 48 seconds to 2 minutes.